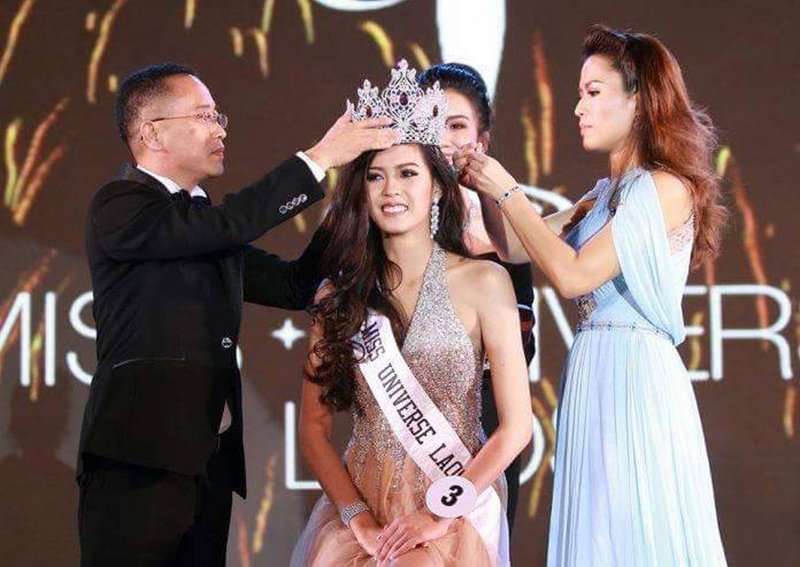 VIENTIANE - Souphaphone Somvichith, has been crowned Miss Universe Laos 2017, following the contest final held last Saturday night at the National Convention Centre. The photogenic 20-year-old also received the Miss Best Personality and Miss Elegant awards. She will be the first ever contestant from Laos to compete for Miss Universe joining the regional round of the international contest. Souphaphone Somvichith received a diamond crown worth 80 million kip and sash from Bountem Gold and Jewelry, 100 million kip cash from TVLao, and 50 million kip in gift vouchers from Kamol Hospital. She also received 30 million kip cash from P-One Cosmetics, a 250 million kip life insurance package from ST Muang Thai Insurance, facial care course valued at 25 million kip from Vanissa Clinic, a note book computer from LT Computers, one year’s free make-up from Patty Salon, and 1.6 billion kip car insurance package from Lao Thepchalern Insurance. Miss On-Anong Homsombath took out the first runner-up prize and Miss Friendship while Miss Varissara Tangsouvanh received the second runner-up and Miss Photogenic in the final. Miss Souksavanh Luanglath got the third runner-up place and Miss Malisa Sidachanh was fourth runner up. First runner-up received 30 million kip cash from TVLao, a sash, 25 million kip in Kamol Hospital gift vouchers, 100 million kip life insurance package from ST Muang Thai Insurance, 12 million kip facial care course from Vanissa Clinic, and 100 million kip car insurance from Lao Thepchalern Insurance. The second, third and fourth runner-ups received 20 million kip, 10 million and 8 million kip in cash respectively along with sashes and prizes from the major sponsors valued at many millions of kip. Meanwhile, winners of Miss Photogenic and Miss Friendship each received 2 million kip and will have the privilege of working with TVlao. Miss Elegant received 10 million kip from Bountem Gold and Jewelry while Miss Best Personality received 25 million kip. The top 5 finalists each received products from Le Skin Thai, All About, Colla SB and I Love Skin Care. During the final contestants modelled sportswear, evening gowns and jewellery from Bountem Gold and Jewelry adding glamour to the night while boy band Xtreme and dance crews provided the entertainment. TVLao received the rights from Miss Universe USA to organise Miss Universe Laos and seek a local representative for the international beauty pageant. According to organisers, the competition aims to support women’s roles in society and promote Lao culture on an international stage. Miss Universe Laos President, Dr Hongkham Souvannavong, Deputy Minister of Information, Culture and Tourism, Mr Savankhone Razmountry and President of Miss Grand International Organisation, Mr Nawat Itsaragrisil, as well as sponsors attended the final.